Ontario’s Liberal government came no closer to a majority after one loss and one win in the highly-anticipated byelections led only to gains for the NDP. While candidate Steven Del Duca managed to hold the Liberal riding in Vaughan, Liberal representative Eric Davis came up short in Kitchener-Waterloo. Unofficial results showed Davis in third with 24.1 per cent of the vote, coming in nearly 16 per cent behind the first-place NDP candidate Catherine Fife. 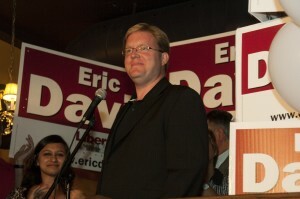 In the previous provincial election, Davis placed second behind former Progressive Conservative MPP Elizabeth Witmer. For Wilfrid Laurier University business student Richard Perera, the result was disappointing, but not surprising. The byelection came at an inopportune time for students, with many participating in frosh week activities or in the midst of moving. While it’s unknown currently how the timing of the election impacted the student vote, Davis acknowledged that he felt their efforts had paid off. “I’m a Laurier grad myself and I actually got involved as a Young Liberal, so I want to make sure that we engage as many people as possible. I think we tried to do that and I think it was successful,” he said. Davis maintained that the results were reflective of the community’s sentiments toward the local candidates, rather than a reaction against the prospect of a majority Liberal government. “They have to work better with the teachers, they have to work better with the unions,” added Salewsky.